Although they may not have always been explicitly stated, library work has always had normative goals. Until recently, such goals have largely been abstract; they are things like knowledge creation, education, forwarding science, preserving history, supporting democracy, and safeguarding civilization. The modern spirit of social and cultural critique, however, has focused our attention on the concrete, material relationships that determine human potentiality and opportunity, and library workers are increasingly seeing the institution of the library, as well as library work, as embedded in a web of relations that extends beyond the library’s traditional sphere of influence. In light of this critical consciousness, more and more library and information science professionals are coming to see themselves as change agents and front-line advocates of social justice issues. This book will serve as a guide for those library workers and related information professionals that disregard traditional ideas of "library neutrality" and static, idealized conceptions of Western culture. 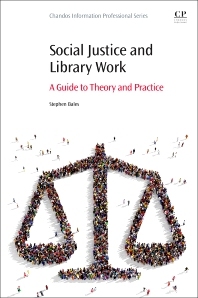 The book will work as an entry point for those just forming a consciousness oriented towards social justice work and will be also be of value to more experienced "transformative library workers" as an up-to-date supplement to their praxis. Stephen Bales is the Humanities and Social Sciences Librarian and Associate Professor at Texas A&M University Libraries, where he is the subject liaison for Philosophy, Religious Studies, Communication & Journalism, and Anthropology. He is also an Adjunct Lecturer at the School of Information Sciences, University of Tennessee. His research areas include the philosophy of libraries and librarianship, critical theory and librarianship, and qualitative methods. Stephen has 11 years of experience teaching graduate level classes in information retrieval, information organization, and cataloguing and classification.